Here are over 50 fun persuasive speech topics to help you create a light-hearted speech that will be enjoyable to listen to AND to write! Many people end up covering the same tired topics that they see in the media each day, only because they can't come up with a better idea. That won't be you, of course, because these topics are fresh and entertaining! The movie rating system is rigged. Marijuana should be legalized and sold in coffee shops. Colleges should loan students textbooks for free. College tuition should include parking and coffee. Schools should not require coursework unrelated student's major. College students should be required to wear uniforms. Jury duty should not be mandatory. Health insurance should be free to all. Students should be exempt from taxes. As gas prices increase, wages should too! Teachers should be required to provide study guides for exams. All college parking lots should have safety lights installed. Becoming a vegetarian makes for a healthier lifestyle. Losing weight is a great way to change your life. Lying is a natural and necessary part of good relationships. Start planning for the future. Don't fall prey to fad diets! Parent-teacher conferences should be mandatory. Say "no" to college credit card offers. Minimum wage should be raised. Luck is not a matter of chance (click to read a sample speech). Michael Jackson was abducted by aliens! Miley Cyrus's twerking was a shrewd publicity stunt. Home schooling is the best education program! Private schools are better than public schools! Satellite is better than cable! McDonalds is better than Burger King. Buying is better than renting. Renting is better than buying. Celebrities receive preferential legal treatment. Reality TV is not "real". Women can do anything men do and they can do it better! Athletes should be good role models. Winning isn't everything but it sure beats losing. Students with "A's" should be exempt from finals. Everyone should own a pet! Wal-mart is the best place to shop! Everyone should take a self defense class. Parents should take an active role in their children's education. Okay, so that's my list of fun persuasive speech topics. Hopefully, they will inspire you to come up with some of your own! 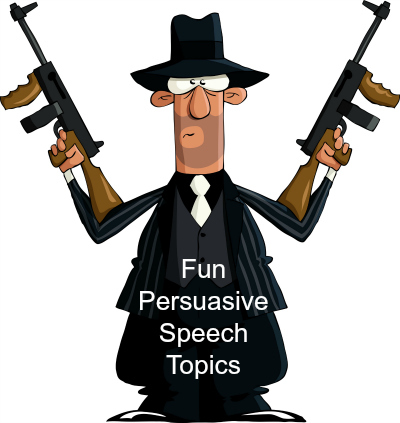 I know just how creative the folks who visit Best Speech Topics are, so if you come up with an entertaining, persuasive speech, use this form to send your speech in and share it with everyone.